Can you pinpoint when and where temperatures went out of limits? Can you assign liability for improper temperature management? Do you know which products to ship first because of shortened shelf life? Can you prove to your customers that you have imports under control? in-transit using smart phone technology. 1. 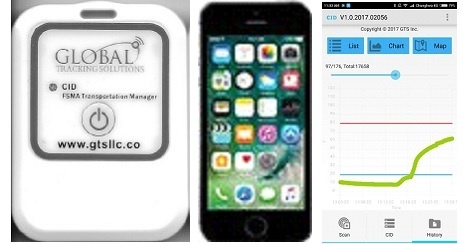 New smart phone app and temperature monitoring tag make in-transit temperature re cording quick, easy and low cost with no installation issues. 2. Pre-cool, load, in-transit and unload temperature, date, time and location and other data are automatically sent to your private cloud database where full reports are available. 3. Temperature monitoring tag and smart phone app are free. You only pay the annual subscription service fee. 4. NO more manual data logger downloads. Eliminate the handling and lost man hours. The Sanitary Cold Chain and Global Tracking Systems have developed the smart phone Food Transportation Manager (FTM) to meet the needs of perishable food importers and distributors who must assure their management and customers that safe food temperatures are established at pre-cool and maintained through long and short transportation processes. * Shippers or carriers load the Container Identification (CID) app into a smart phone. * FTM tag is started - all data entries are automatically time/date/GPS stamped to provide complete record keeping. * Tags are returned to shipping point for reuse (up to 2 years on a single battery). Tag replacement is free with the subscription service. If you have questions or want to talk, you may call or write directly or use the form below.